A tie-dye project is a great summertime art activity for kids and adults. While it can get a little messy, it’s a fun project for a warm day with wearable results. 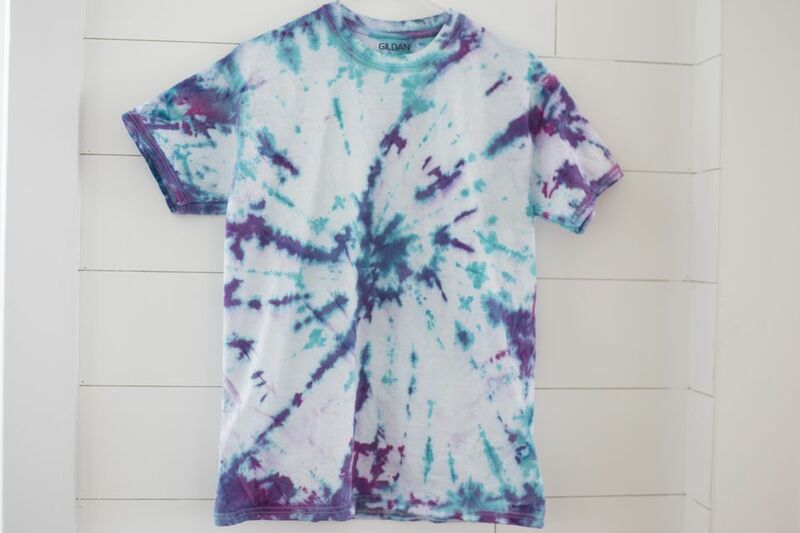 An easy-to-find dye kit is the simplest way to make a tie-dye project. It comes with everything you need in one package. If you cannot find one, using individually bought dye and materials will also work. 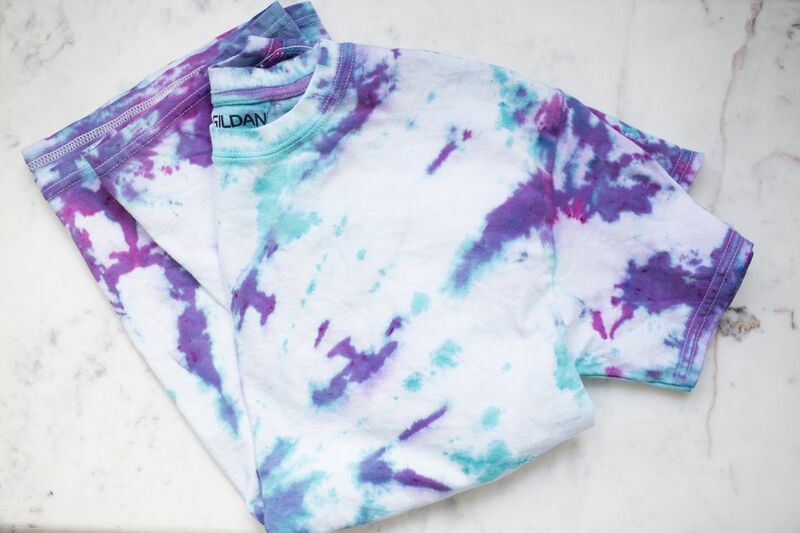 While tie-dying, wear old clothes that won't matter if they get stained. Even with gloves and an apron, it's likely dye could end up somewhere it's not supposed to. Mix your dye bottles according to the package instructions and set aside. Go outside and cover any surface that you don’t want dye on with plastic sheeting. Any spills outside are less worrisome than spills indoors. Lay your t-shirt down completely flat on your work surface. Find the center of the shirt. Place the tines of the fork into the center of the shirt, like you’re jabbing the t-shirt with the fork. Swirl the fork the same way you’d swirl spaghetti. Keep swirling until the shirt is rolled into a circular shape. Take four rubber bands and wrap them around the t-shirt to secure the swirled circle. Wrap one around the top, so it’s running down the center of the roll. Then do a few diagonal wraps. All of the rubber bands should meet in the middle, forming an asterisk shape. If you feel like the wrapping needs to be more secure, add a few more rubber bands to ensure that the shirt will keep its shape during the dyeing process. If you are using them, apply the dye with the plastic squeeze bottles. Try to fully cover the shirt with dye and use multiple colors. If you are using bigger tubs of dye, you'll have to dip parts of the shirt in the tub. It can get tricky dipping the shirt in the tubs without having the color spread too much. Once the shirt is fully covered in dye, wrap it in plastic and let it sit for six to eight hours. The dye setting time and specific directions will vary based on the dye. Wearing gloves, unwrap the shirt and remove the rubber bands. Rinse the t-shirt in warm water, then gradually adjust the water temperature to cool. When the water runs clear, you are done rinsing. Hang the shirt outdoors to dry. Note that the t-shirt will likely drip while drying, so if you are drying it indoors, take caution. The first time you wash the shirt, wash it alone (or with items that you don’t care too much about) as a precaution to prevent the dye from bleeding on other fabrics.